As autumn turns to winter, and the cold creeps into the creaking, century-old mining shack we call home, I find myself spending more and more time in the kitchen, hovered over stew pots and tending a hot oven full of baked goods, if only to keep warm. So, I bake cookies with my little boy. I toss sourdough starter with freshly ground flour for our daily, no-knead sourdough bread. And I make muffins, for simple breakfasts served with softened butter and scant spoonfuls of honey. I also tuck them away into my lunch boxes, as a special treat. Among my favorite are cornbread muffins: lightly sweetened by honey and dotted with butter that melts ever so slowly. I love the combination of blueberries folded into the cornbread batter. They add a touch of lightness, and a little surprise to the muffins. I tend to favor blue cornmeal, when I can get it, as it’s particularly rich in phytonutrients, and its very light blue color is particularly charming when paired with the dark dots of blueberries, melted into the muffins when baked in a hot oven. That’s why I was excited to work with PureLiving Sprouted Flours and develop recipes using their flour for this post. And, FYI, their hosting a BIG giveaway over on their Facebook page, so you should check it out now. When I cook with grains in my kitchen, baked or otherwise, I do my best to make sure I’m soaking or using the slow, old-world technique of sourdough leavening, as these processes improve not only the flavor and crumb of baked goods, but the bioavailability of the nutrients they contain as well (you can learn more about soaking, souring and sprouting in my cookbook here). Of course, I don’t always plan ahead, and find myself whipping up muffins in the morning, or other quick-rise breads that don’t particularly benefit from the techniques of soaking or sourdough fermentation, and in these instances I lean upon whole-grain sprouted flours. Sprouted whole grains and sprouted whole grain flours are particularly rich in nourishment, and while the sprouting process is one that is relatively short, it yields beautiful results. Sprouted grains (and their flours) are typically higher in vitamin B, vitamin C as well as antioxidants like carotene than whole-grain flours. Further, like soaked and soured grains, sprouting mitigates the effects of food phytate, making the minerals in sprouted grains more readily absorbed. Sprouted flour functions slightly differently in baking than whole grain or all-purpose flour. You can typically substitute sprouted flours at a 1:1 ratio, but many sprouted flours (particularly gluten-free flours) work better and give better results if they do not constitute the only flour used in the recipe. For this reason, it’s best to use multiple types of flour, while keeping the total amount of flour the same as in the original recipe. Here, I’ve paired sprouted blue corn and sprouted buckwheat flours. Sprouted flours tend to taste slightly sweeter than regular flours, and so I recommend reducing additional sweeteners added to your recipe, lest they taste too sweet. Sprouted flour is available in many large natural and health food stores, but you can purchase sprouted flours online which is easy and convenient. Check out this range of gluten-free sprouted flours from PureLiving here. Beyond the sprouted blue corn and sprouted buckwheat flours I use in my muffins, they also feature several other varieties like black bean, amaranth and millet (see the full line here). PureLiving is offering 20% off to Nourished Kitchen readers. Use the coupon code: LIVNourished at checkout. PureLiving sprouted flours are produced by Shiloh Farms, a company I’ve enjoyed for a long time, and they focus on simple, wholesome sprouted, gluten-free flours. Right now they’re running a big giveaway on their Facebook page where they’re giving away a KitchenAid mixer and loads of other goodies, so go check it out and enter here. 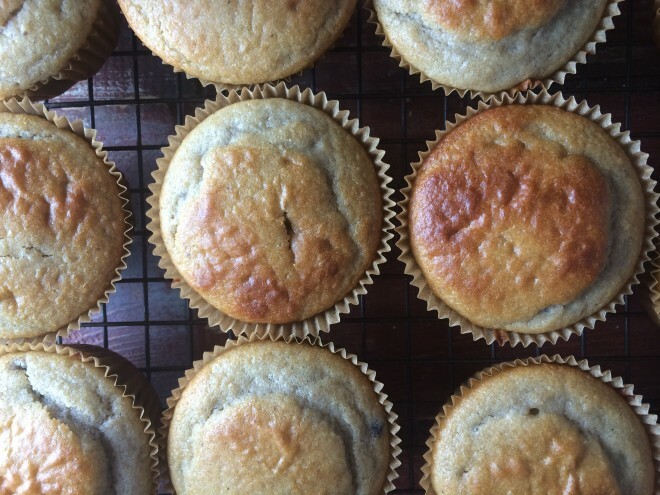 Wholesome and light-textured, these Blue Corn, Buckwheat and Blueberry Muffins are made with sprouted flours (available here), honey, eggs, and blueberries. Mildly sweet, with the distinct flavor of corn and buckwheat, these muffins are lovely in the morning for breakfast, topped with fresh butter. Line a muffin tin with muffin cups, and heat the oven to 400 F.
In a medium mixing bowl, whisk sprouted blue corn flour and sprouted buckwheat flour together with baking powder and sea salt. In a separate bowl, beat buttermilk, eggs, vanilla and honey together until uniformly combined. Slowly pour the wet ingredients into the dry ingredients, beating them as you pour to form a smooth and uniform batter. In a smooth stream, stir in the butter, and then fold in the blueberries. Spoon the batter into the muffin cups, filling them ⅔ of the way. Bake about 15 minutes or until a toothpick inserted into the center of the muffin comes out clean. Love this info on the sprouted flours. Heading over to the giveaway too! Thanks! I love you used Sprouted Blue Corn – great ingredient. You are a real Chef! I entered your tiger nuts contest and received a email that I won.!!!! So I just wanted to say thank you for your kind generosity. i hope this comment reaches you.Have a positive day. Coupon code did not work when I selected 4 different flours. I was *just* about to do a search for baking bread w/ sprouted flours and your newsletter arrived. I’m just getting back into making my own country bread (The Tartine recipe — the no-knead recipe’s very complex older uncle : ) and was wondering if I could use sprouted ww since I have a ton of it. I’m making my starter/culture with it and it’s behaving really nicely so far, but really unsure about using it for the dough. Thoughts? I have been wanting to try sprouted flours and this definitely seems like a good opportunity. I have entered the giveaway. I think it is a typo on this website. I tried LIVNourished (on a hunch – LIV brand), instead of LIVENourished. It worked yesterday. Looking forward to getting these flours and making these…i love blue corn, buckwheat and blueberries! Any thoughts on the best substitutions for those that need to avoid lactose and soy? Thanks! We don’t eat corn. What flour can I sub for the blue corn flour? These muffins look delicious. Thanks for the information on sprouted flours. I just made these this morning. A little place down the road carries non GMO blue popcorn meal and I have been excited to try it so when I saw your recipe I went and bought some. It was not spouted so I soaked my flours overnight in the buttermilk. My muffins came out very dark so it must be that the sprouting lightens up the buckwheat flour? They are delicious though. Thanks for the inspiration and the recipe. I made these a few days ago. They taste great but stuck to the muffin liner. Has anyone else had this problem? Any suggestions? I was thinking about buttering the muffin liners but I’ve never done that before. I didn’t have sprouted corn flour on hand so I used organic corn flour. Mine stuck as well. Also baked for a little longer than the suggested time but the tops didn’t brown up like the picture. Also, is there a way to stop the blueberries from congregating at the bottom of the muffin? Ordered the special flours (wow, expensive) and made these last night. I used all coconut products for the diary and they turned out well. A bit plain for my tastes though. I would add some lemon zest and maybe a bit of coconut sugar on top of the muffins before baking next time (the muffins really weren’t very sweet). Thanks so much for Sharing! These turned out great. My older son who never eats corn muffins gobbled these up. I had white sprouted corn flour on hand but no buckwheat, so I just used a gluten free blend. I’m going to make these again for Thanksgiving except I am going to use your cranberry orange relish instead of blueberries by baking it in the center of the muffins. I’ll let you know how they turn out. Looks great, but I’m dairy-free … any alternatives you’d suggest for the buttermilk? I bought both of these flours from VitaCost and made the muffins as directed this morning. They turned out great. I had to bake them for about 19 minutes. I found the flours really easy to work with – you get what you pay for! Is there a non-milk substitute for buttermilk? These have a great hearty flavor, but like someone else mentioned, all of the blueberries sunk to the bottom & half of each muffin stuck to the liner, so a lot went to waste. Any suggestions to help the muffins hold their shape? Hi, Pure Living don’t seem to have blue corn flour on their website anymore. What you replace this with? I would use this one: http://amzn.to/2kGGWWw. It’s yellow corn flour, but it’ll do just fine. My kids loved these. Thank you! I used corn masa flour and regular buckwheat flour and they turned out great. I did have to bake them for 20 minutes though as my berries were frozen.